I’m just kidding, of course. I couldn’t fool anyone into believing that, but even though you know what my books are not about, it appears to me that many of you don’t really know exactly what they are about. So allow me to tell you a little more about one of my true works of passion. When I grew up in Germany, horror movies were a rare commodity. Age limitations, which were rigorously enforced in those days, prevented me from going to see the latest bloodfests in theaters and the only way for me to experience horror movies were Saturday late night showings of classic horror films on TV. 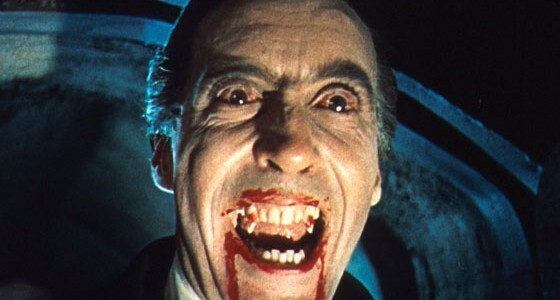 As a result, whenever a movie like “Horror of Dracula” was scheduled, that day was a veritable holiday for me. Even though I am dating myself now, please remember that this was in the days before home video or cable TV. Yes, such a time existed, in the not too distant past, actually. Combined with horror literature, this was the only way for me to experience horror in those days. I would pour over William K. Everson’s “Classics of the Horror Film” with its countless still photographs for endless hours, reading about the innumerable horror films I had never seen and those I had watched. The book was to me what the bible is to Catholics. As a result I developed a deep and lasting love for classic horror movies — the great monster movies of Universal’s golden era, the German expressionist films by Murnau and Lang, the stylish films of Val Lewton, the work of Mario Bava, Roger Corman’s Poe-adaptations, Boris Karloff’s body of work and above all, the masterfully atmospheric Hammer Horror films. I literally ate these movies up and there is a really good chance that I could probably bore you to death with trivia details about films from that era. This love for the classics of the genre has never abated and it was the forge in which the creation of Jason Dark, the hero of the many supernatural mysteries stories I have written, was shaped. But it actually goes a long way beyond that. My love for detective stories and thrillers plays into this as well, along with a long-standing faible for a certain German dime novel series and my fascination with history. When I began writing the first Jason Dark mystery, “Demon’s Night” I wanted to create something that has the intrigue of a detective story, the mystery of a classic horror movie, the emotional roller-coaster and action of a thriller and a dash of history. But I can hear you — enough with the background, already, how did it turn out? What exactly can I expect from your books? The Jason Dark mysteries are supernatural mysteries, period pieces, playing in Victorian England. To me the Victorian era is simply magical and the epitome of classic horror. I mean, look at the truly iconic monsters — Dracula, the Wolf Man, the Mummy, Dr. Jekyll, Jack the Ripper… they are all creatures of the Victorian era. Even Edgar Allan Poe’s stories are mostly taking place during early Victorian times. For that reason I picked Victorian England as the backdrop for the Jason Dark books, and London, in particular, is the scene for many of the adventures, with its fog-shrouded nights and cobble-stone streets. Think of it as Sherlock Holmes on steroids, a super-sleuth fighting demons and monsters. But there’s a lot more to it. Steampunk elements create an alternate world almost, in which Dark and his friends come up with magnificent inventions to track down evil. Unlike modern day horror, the stories are not overly gruesome or gory. They use atmosphere to set the mood and give you shivers. I’m not a big fan of urban horror or splatter and to me it has always been much more fascinating to suggest horror rather than to explicitly show it. Nonetheless, there is plenty of blood in the stories to firmly place the adventures into the horror realm, but to me it is the traditional “gothic horror” of old rather than the cold, modern horror many people associate with the genre nowadays. The real spice in the stories, however, are the countless historic and literary references. It is hard for me to talk about these without spoiling the fun but you will find many, many names, locations and events that are rooted in actual history or are taken from literature. Don’t be surprised to stumble across people like Inspector Lestrade in a Jason Dark book, or square off with someone like the Countess Elizabeth Báthory, a notorious serial killer who killed over 600 people — I am not making this up. She was real! There are tiny little breadcrumbs in every one of the books that readers can discover and even though each story is standing entirely on its own, when you read the books as a series, you will see how certain names and events actually lead up to others, how there is a recurring cast, how there are villains that just can’t be kept down, how there are world events that play in the overall narrative. The best thing I could probably compare the Jason Dark books to is probably Stephen Sommers’ 2004 movie “Van Helsing.” While purist horror fans may have wrinkled their noses at it, the fact of the matter is that it was a jolly good romp with great visuals, fun characters and action to boot. In many ways that is what my Jason Dark books are about, too, while always making sure not to take themselves too seriously. “Demon’s Night” and give it a try. If you’ve read this far into this blog post, you’re obviously fascinated by the subject matter to some degree. I am pretty sure you’ll get some enjoyment out of the book as well and please don’t forget to leave a review if you have read this or any other ones of the Jason Dark books. This entry was posted in Blog and tagged Boris Karloff, dracula, Edgar Allan Poe, gothic horror, hammer, hammer films, horror, jason dark, Mario Bava, Roger Corman, steampunk, un, universal monsters. Bookmark the permalink.